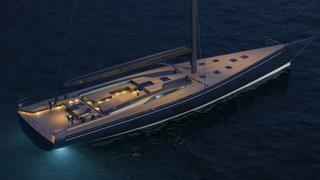 The yacht has been described as "a powerful 63 ton all-carbon racer cruiser"
New details and renderings have been released about the RP-Nauta 100 custom sailing yacht currently in-build at Southern Wind Shipyard. Work is continuing on schedule on the 30 metre high performance cruiser and hull lamination is underway. The yacht remains on track for its scheduled spring 2020 delivery. 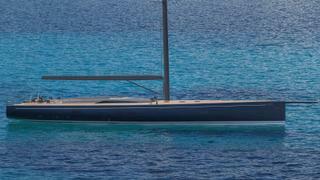 The yacht will hit the water in the "upcoming months", Nauta said. Commissioned by an experienced yachtsman, the yacht has been designed inside and out by Nauta Design with naval architecture by Reichel Pugh Yacht Design. The two previously collaborated on Southern Wind's first custom sailing yacht Allsmoke, delivered in March 2017. The owner's brief called for "a very fast performance cruiser" with "an aggressive and sporty" aesthetic. As a result, Nauta prioritised functionality, performance and a design "sleek" enough to "turn heads". 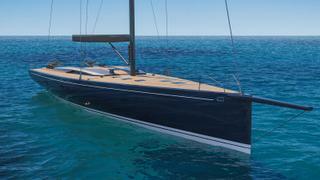 The result is "a powerful 63 ton all-carbon racer cruiser" with a lifting keel, elegant flush deck and large sail area for performance. Accommodation will be for eight guests in three guest cabins and the owner's suite, which will be set forward. The crew area will be positioned aft and will include two crew cabins, a control station, galley and crew mess.